I have five children at home so it's rare that I get a chance to sit back and pampered like a princess. But today I had the opportunity to be buffed, massaged and have my nails painted. Vy switched on the first class massage chair and invited me to 'Sit back and relax' and I immediately felt at ease. Without any delay, my feet were soaking in deliciously warm water ready to start my treatment. Corine was my experienced therapist today. It's clear she loves her job and works with speed and skill. I admit that I am sometimes reluctant to have my feet touched, but I cringed not once. I loved the hot paraffin wax. No wonder everyone's talking about it. It feels great and acts like a moisturiser, it improves circulations and is good for rheumatism. Besides that, it feels sensational before and after the treatment. Who would have believed my crusty old feet could ever feel like baby's skin? My nail treatment was divine. 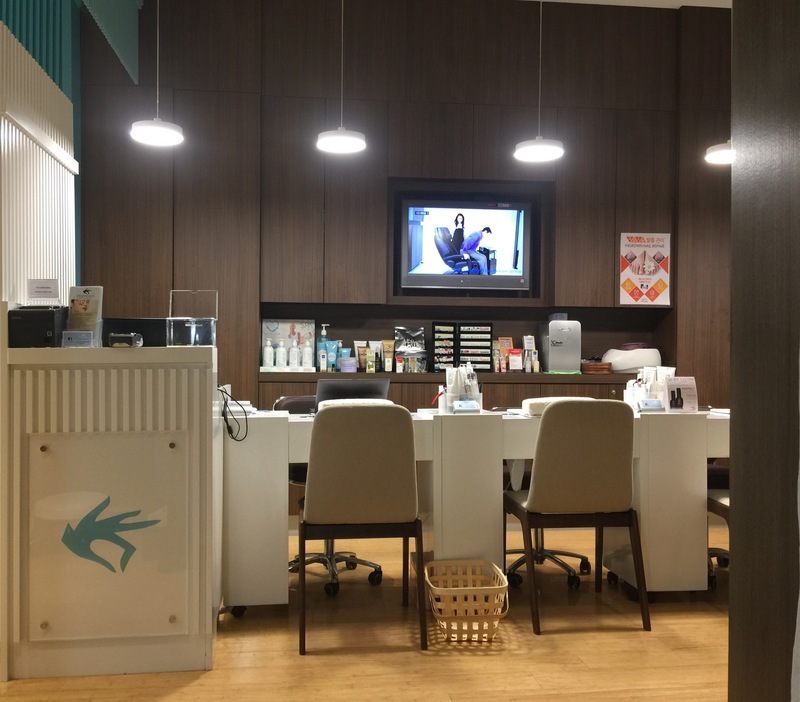 It included a firm hand massage as well as the usual cuticle care, buffing, filing and painting with a base coat, colour and topcoat. I could not pick a colour despite the hundreds available, so I went with the recommendation of Anna and Corinne. This is the first time I have had combination nails of pink and silver and I love it. This was perfect timing for me because my nails have been flaking and chipping easily so they applied a special product to protect and help nails grow. This is a natural product designed to penetrate into the nail and create strength from the inside and not just sit on top. It works straight away. Vy, the stunning young owner and manager of this classy Wellness and Beauty Bar, kept checking in with me to see that I was being well looked after. With quality fittings and equipment and caring friendly staff, they have a lot going for them. Vy has another store in New South Wales, but this is the first one she has opened in Melbourne. She meets and greets every client and ensures they have the best possible experience. They have only been open two months but already they have 80-90% return customers and know them by name. Vy explained that 70% of the products are organic. They are the best quality available, exclusive and carefully selected from America and Korea. For your peace of mind, they use hospital grade autoclave equipment and are very hygiene conscious. For example, they use pedicure plastic liners in their feet tubs and one-time use products such as sanding paper. I was amazed when I realised I had been there for over an hour and a half. The time just flew. 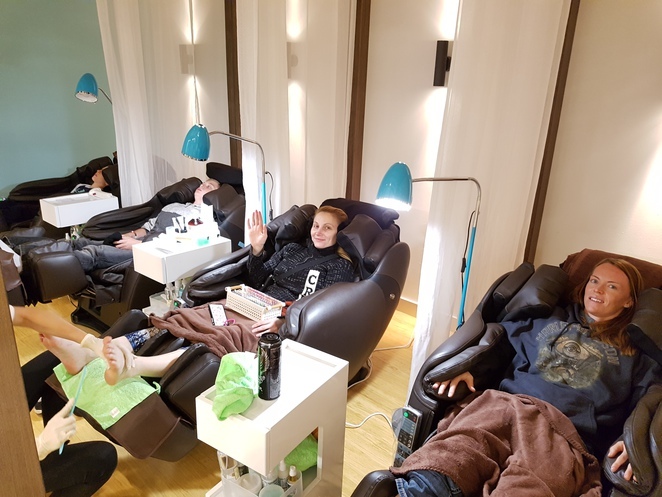 I think I got a little lost in the forest of massaging chairs, the mani and pedicure… but I emerged a princess feeling de-stressed and grateful that I had received the right royal treatment. At the moment, you are need to book on Saturdays, however it was pretty busy when I went on a Thursday, so you may wish to ring in advance. Organique has options for all budgets. For example, they offer an Express service, which is affordable and quick. An Express Mani is only $15 and Express Pedi $18. This includes nail trimming, shaping, cuticle care, buffing, cuticle clean, choice of nail lacquer and moisturiser. A Makeover Mani includes all of the above plus feet soak, callous removal for just $20 or $35 for a pedicure which is also competitive. The Deluxe is unique to their store. As well as all the other aspects of treatment, this includes an exfoliating scrub, soothing mask, callous removal, paraffin treatment and a touch of collagen serum. The deluxe Mani is $35 or deluxe Pedi $45. You can't get anything like it anywhere else this is the most popular treatment. Vy told me that people are telling others and no one else does it like them. There are plenty of possible add-ons to customise your treatment, for example, French nail polish for $5, age defying mask $10, stone massage $10, extra therapeutic massage for $20. They do not use fake acrylic nails because they are not organic. The signature nail extensions system is $50 or an extra $10 for shellac. Organique also have waxing, tinting, retail products and eyelash extension treatments. They even have treatments for ingrown toenails. The pampering is not just for ladies, Organique is well visited by men and children love it. For only $8 your little a princess or prince can have a Mani or Pedi for just $12 (under 12-year-olds only). Wedding packages are available. Experience the difference for yourself. Vy has a special offer for Weekend Notes Readers only: 10% discount on all services with booking and mention Weekend Notes. Not available on Saturday, valid until 30/9/16. Organique Wellness and Beauty bar is located at 325 Chapel Street Prahan in Pran Central, enter between the ANZ bank and Wittners shoes.